The surviving members of the late 1990s alternative metal band THE DEADLIGHTS will reunite for a one-off show as a tribute to the group's late frontman Wilfred "Duke" Collins, who died a year ago from a heroin overdose. The concert will take place on Saturday, March 19 at The Underground DTSA in Santa Ana, California and will also include a performance by DEATH DIVISION, the new band led by ex-THE DEADLIGHTS bassist Jerry Montano. Proceeds from the event will go to Bridging The Gap, a non-profit organization started by Montano and Duke's mother Sharon Gipson to help addicts with living expenses during recovery. 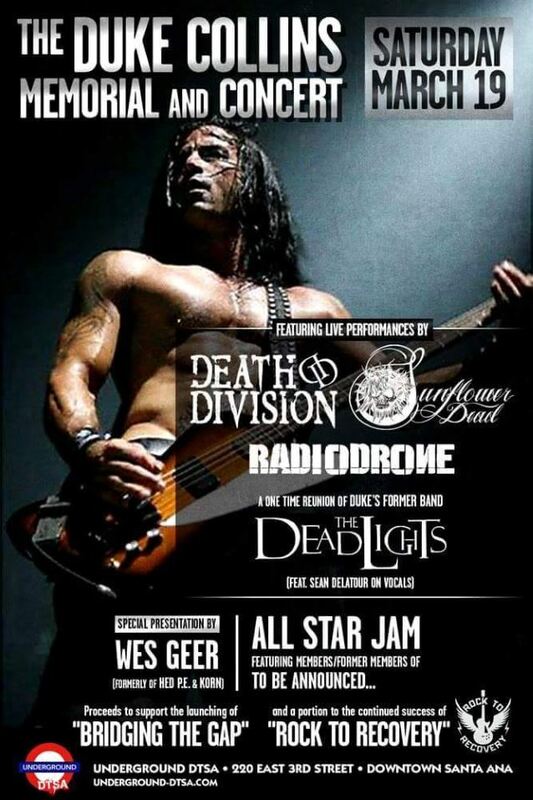 Fronting THE DEADLIGHTS for this special concert will be Sean De La Tour of DEATH DIVISION, which has just re-released its EP on iTunes with the previously unavailable bonus track "Pestilence". Also scheduled to appear are SUNFLOWER DEAD and RADIODRONE. THE DEADLIGHTS' self-titled debut album came out in February 2000 and was followed by the band's appearance on the second stage at that year's Ozzfest. In early 2001, THE DEADLIGHTS lost their record deal with Elektra and broke up. Montano then teamed up with NOTHINGFACE and subsequently joined the DANZIG touring lineup before helping form HELLYEAH.